“We Can Be Heroes” is an odd but not entirely unsuccessful episode of Supergirl in an odd but not entirely unsuccessful season of Supergirl. It swings from some genuinely funny light comedy to a genuinely moving exploration of genocide, but somehow that’s not anywhere near as tonally jarring as it sounds. It’s an episode that directly addresses some of the weak spots in the show’s second season, to varying degrees of success. And it’s also an episode that tries to get me to believe Livewire is Supergirl’s most stress-inducing nemesis, which, well, thanks for trying Supergirl. “We Can Be Heroes” isn’t the most cohesive episode—in fact, at times it’s downright scattered—but it has more ambitious aims than the past handful of episodes have and that goes a long way in my book. If there’s one thing that holds “We Can Be Heroes” together it’s a focus on the show’s male characters. Through I’ve already seen some griping about that on Twitter, I don’t mind when an episode of such a female-focused show shakes things up every now and again. I don’t think Supergirl needs to turn in its feminist card for downplaying Alex, Maggie, and even Kara this week given that they’ve all had plenty to do this season. Especially because Supergirl’s male characters were in need of a bit more shading. After taking a backseat last week, J’onn gets a lot of focus tonight in a story that is both the strongest and the most disconnected element of “We Can Be Heroes.” When a White Martian psychic attack lands M’gann M’orzz in a coma, J’onn has to put aside his hatred of her to form an intimate mental link that will save her life. Supergirl has never been afraid to go dark with J’onn’s backstory and that’s equally true tonight. He learns that M’gann rebelled against her people after being asked to kill a young Green Martian. She slaughtered her fellow guards instead and expected to die herself, only to somehow survive and wind up on Earth. She and J’onn connect over their survivor’s guilt, and J’onn—relying on emotional support from his two surrogate daughters—finds a way to forgive M’gann. David Harewood acts the hell out of the surprisingly meaty material, and the story really only suffers from being relatively removed from everything else in the episode. Livewire’s reappearance allows Mon-El to take his first official trip to the field after graduating from “superhero kindergarten.” But he lets his feelings for Kara get in the way when he prioritizes her safety over the safety of some police officers, thus breaking her number one superhero rule to always protect civilians. Although Kara’s decision to become a superhero was born out of a straightforward desire to help people, Mon-El’s motivations are more complicated. He wants to help people too, but he also wants an excuse to spend time with Kara. “Supergirl trains handsome doofus” may not be the most innovative storyline in this show’s history, but Supergirl at least executes it well. Kara and Mon-El’s team-up offers strong thematic material about heroism—which has always been Supergirl’s bread and butter—and takes advantage of the easy chemistry between Melissa Benoist and Chris Wood. The disconnect between conception and execution also rears its head in the James/Winn Guardian storyline, which has long been the albatross around this season’s neck. Yet despite its fundamentally flawed premise, this is probably the best use of Guardian yet (admittedly, a low bar). After he’s zapped by Livewire, Kara finally discovers James is the one behind Guardian’s low-budget Batman getup. She takes a surprisingly hard stance against the idea of James working as a vigilante on the grounds that superheroing should be left to those with powers. It’s a bizarre position given that Kara regularly fights alongside human DEO agents—including her own sister—but it’s a way to drive a wedge in the once tight Super Friends team of Kara, James, and Winn. It’s a relief to finally have the “James is Guardian” secret out in the open. And it’s also nice to see James and Kara together again. Their scene in Cat’s office is a lovely reminder of the time when their friendship played a more central role in the show and when CatCo felt like a more vital location. 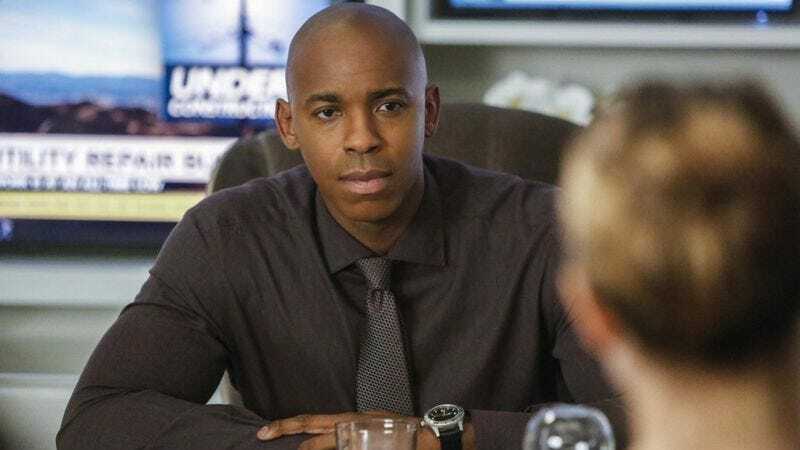 And Mehcad Brooks gets to do more acting than he’s done all season as he makes a case for why being the Guardian is his true calling. While his motivation remains fundamentally murky, Brooks sells the hell out of the material he’s given. Again: Weak concept, solid execution. And it’s not just the acting that elevates “We Can Be Heroes.” Director Rebecca Johnson has a strong eye for action, using slow motion to great effect without overusing it. There’s also a relatively interesting twist to the villain-of-the-week story, in that Livewire turns out not to actually be the bad guy this time. She’s being used by a villainous scientist who wants to figure out how to copy and sell her powers to the highest bidder. It’s a bit underwritten (I don’t think the evil scientist even gets a name), but it allows Supergirl and Livewire to briefly team up to take down their mutual enemy, which is a nice change of pace from Livewire’s previous one-note villainy. Despite their protestations about how ready they are to fight crime, it turns out Mon-El, James, and Winn still have some things to learn. Their attempts to take down Livewire blow up in their faces, requiring Kara to swoop in and save them. I’d love to see the show return to the idea that being a hero doesn’t solely mean being a fighter (remember when Cat inspired the city with an on-air speech? ), but at least having James’ secret out in the open will allow Supergirl to discuss that concept more explicitly. While I don’t have high hopes that the Guardian storyline can ever fully be salvaged, “We Can Be Heroes” at least takes a big step in the right direction. Mon-El thought James was just a “professionally handsome desk person.” Fair. If James is so desperate to be a hero, couldn’t he just join the DEO as an agent? Is there a specific reason he needs to be a vigilante? That seems like a really obvious solution to this problem. Although if/when that does happen, it will all but seal the fate of CatCo as a central location. Mon-El confesses he has feelings for Kara, but shuts down the idea of them being together before she has a chance to respond, kicking their inevitable romance just a little further down the road. While explaining that he remembers their earlier kiss, Mon-El tells Kara, “You must have been sad because your eyes were insanely blue.” Does that make sense? Does eye color change with emotion? Does Mon-El just not know the word for “tears”? There was a “nasty woman” reference tonight. Make of that what you will. Next week: The White Martians are coming! The White Martians are coming!